Our fresh pasta is the mouthwatering culmination of a creative amalgamation - a mixture of modern innovation and traditional pasta-making techniques. It’s unique and eclectic, but every aspect of our pasta making can be traced back to Italia. Many are the theories that have been presented concerning the origin of the pasta product. Some researchers place its discovery in the XIII Century by Marco Polo, who introduced the pasta in Italy upon returning from one of his trips to China in 1271. On chapter CLXXI from the “Books of the World’s Wonders”, Marco Polo makes a reference to the pasta in China. In our opinion, the pasta dates much further back, back to ancient Etruscan civilizations, which made pasta by grinding several cereals and grains and then mixed them with water, a blend that was later on cooked producing tasty and nutritious food product. Let see some pasta's important history events. When the Greeks founded Naples, they adopted a dish made by the natives, made up by barley-flour pasta and water dried to the sun, which they “macaria”. We also find references to pasta dishes in the ancient Rome, which date back to the III century before Christ. In fact, the Roman Cicero himself speaks about his passion for the "Laganum", the “laganas”, which are strips of long pasta (wheat-flour pasta shaped as wide and flat sheets). During that time, the Romans developed instruments, tools, procedures (machines) to manufacture the pasta for lasagna. Ever since, cereals have exhibited great facilities for both its transportation as well as its storage. It was the Roman expansion and dominion which fostered the harvest of cereals in the whole Mediterranean basin. Rome’s granary par excellence was Sicily, but what and cereals were "imported" from the Mediterranean strip of Africa and the Lebanon, and later on, during Augustus’ empire, from Spain, Sardinia and Syria. About 400,000 tons per year are estimated. The guaranty that each inhabitant could receive his/her necessary ration of cereals depended on the important maritime traffic, subject to storms, shipwrecks and inexperience; and it also depended on the storage capability as well as on the care of the stored goods. The term macaroni, with which a type of long pasta is currently referred to, is found in writings of Roman writers since the first centuries of our era. Platina, curator of the Vatican library, wrote in the XII century that macaroni with cheese were a legacy from the kitchens of Genoa and Naples, where its inhabitants ate everyday. In a book called “The Cooking Pan”, from the XIII century, it was determined that lasagna was eaten as pasta strips in enriched broths. The term “laganas” is found in the book named “Of the Culinary Art” from Apicio. In a Codex from the XIII century, which can be found in the University of Bologna, we can reed the description on how lasagna is made. 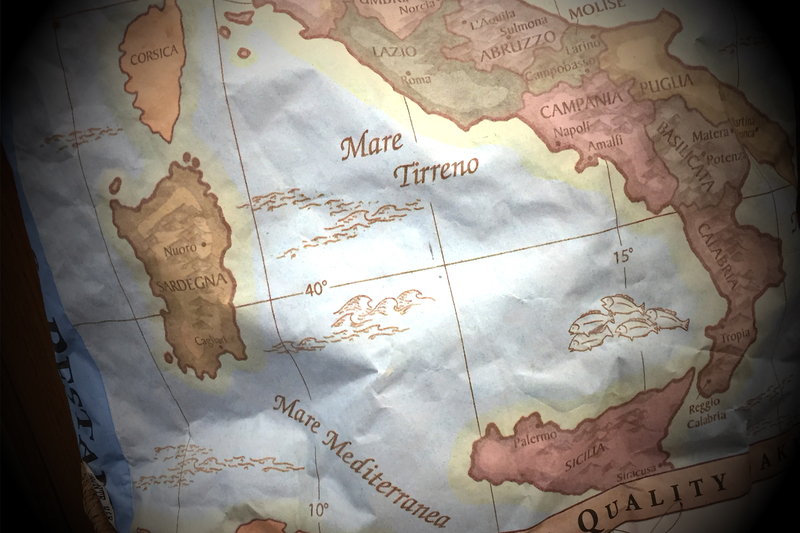 On the other hand, it very likely that pasta reached Naples from Greece; Naples was once a colony of the Greek empire. In modern history pasta was already widely accepted in Spain, most of all starting from the XVI century, the era of the Spanish viceroyalty in Naples. Hence, fresh pasta was used and appreciated in Italy since the time of the Etruscan and the Romans. As the centuries went by, pasta continued to appear in the tables of Italy with different names. For example, in the 1400 pasta was called "lasagna" and pasta manufacturers were referred to as "lasagnare". In the 1800 the name was changed and they were referred to as "vermicellai". But between the 1400 and the 1800 between the "lasagne" and the "vermicelli" the "fidelli" were born; these were pasta thread with a cylindrical shape. In this way, the pasta manufacturers also became the "fidellai". At the onset of the XVII century we found in Naples the birth of the firs and rudimentary machines for the production of pasta; it was here were the maximal level of perfection in its manufacturing process took place, with a higher precision in Gragnano, a few kilometers away from the city of Partenopea, the site where the way of drying and preserving pasta was developed, thanks to the special climate crated by the alternative of the (dry) Ponentino winds and the (warm and humid) Vesubiano winds, which generated the conditions for an excellent manufacturing process of pasta, laid out to dry on the streets. The extension of the kneading machine and the invention of the press, made it possible to produce pasta at a low prices. This is the way in which it became the food of the people. At the beginning of the XIX century, the most refined cooking that triumphed in the tables of the nobility was made up by pasta dishes; little by little its use became a gastronomic habit among the high classes. During this century the dry pasta consumption spread quickly among the whole Italian society. Pasta consumption became a trendy thing and its offering to guests became a sign of distinction. Until then, pasta was eaten with the hands, and the addition of sauces rendered that way of eating pasta no longer the most adequate one. Hence, an additional instrument started to show up at the tables of the high classes. Its use started by being another element to impress the guests, rather than to help them eat. When eating pasta with tomato sauce became a general issue, the fork was then adopted as an everyday tool, and a new fork format, specifically made to eat pasta, appeared. The same was made up of four curved tips with a length not larger than twice its total width. In 1878, the Marsellais Purifier was invented; the name sprang from the inventor himself, and it was used to improve the semolina and, hence, to improve the pasta. Initially, the pasta was seasoned with tomato sauce and oil, to then be enriched by the creativity of housewives, chefs and gourmets, who started to mix it with typical Italian products such as mozzarella cheese, Parmesan cheese, ham, and cured swine meat, in addition to other types of cheese, meats and fish. During the present century, pasta was consolidated as a main ingredient of the Italian cuisine. For 1914, the artificial drying process allowed the pasta to be available in all the regions of Italy. The great development of the Italian pasta at the turn of the century was tightly linked to the export, which reached a record level of 70,000 tons, many of which were sent to the United States of America. Later on, importing countries started to produce machines to manufacture their own pasta products, and these managed to conquer the world. From then on, people started to refer to this phenomenon as “The Industry of Pasta”. from Italian traditions, the best pasta experience. we pay a lot of attention to the smallest details – something you might not expect for a food as simple as pasta. Here’s why: the quality and the care lavished on every ingredient at every step, turns what might have been an ordinary dish into an extraordinary eating experience. We are one big family all genuinely mad about fresh pasta and the pure satisfaction it brings to the taste buds. We strongly believe there’s much more to pasta than flour and water. Our pasta comes from the factory floor, made fresh every morning from the skilled hands of our very own artisan pasta makers. Our style of pasta originates from the regions of southern Italy, where food and agriculture are truly embedded in people’s sense of identity and belonging. Our Factory utilizes the age-old technique of pasta extrusion, which originated from the South of Italy. ‘To extrude’ is defined as ‘to push out’ or ‘to shape’, and through this method of creating fresh pasta, dough is pushed through bronze dies which hold the shapes of common pastas. Once pushed through, the pasta dough comes out looking like the pastas we know and love. The method of extruding pasta with bronze dies does not just result in fresh pasta which uses the revered Italian tradition, but also in pasta with a very distinct texture. Because of the high pressure and the ensuing tension from extruding, what comes out is pasta with a coarse texture. This is a defining quality of artisan pasta extruded from bronze dies, and is also the feature that we think makes it special. One more thing that makes our fresh pasta unique is its flavors. We use only the best italian flours in our production. The flavors we add to our pastas are sure to enhance its natural tastes, as well complement sauces really well, leading to a brand new gastronomic experience.